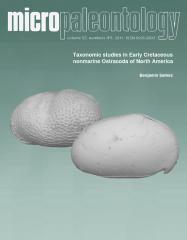 ABSTRACT: The revision of Theriosynoecum Branson 1936, a common ostracod genus of Middle Jurassic to Early Cretaceous nonmarine deposits worldwide, demonstrates that its representatives–particularly the Early Cretaceous North American ones–are not as endemic as hitherto assumed. The taxonomic concept applied herein resolves many problems resulting from an overestimation of the taxonomic (in-)significance of some ornamentation elements in the genus as well as the too regional view of the faunas during the second half of the 20th century. This is the first step to a supraregional biostratigraphic and improved paleoecologic application of representatives of the extinct genus Theriosynoecum (Cytheroidea, Limnocytheridae, Timiriaseviinae). Theriosynoecum fittoni (Mantell 1844) and Theriosynoecum alleni (Pinto and Sanguinetti 1962) are proposed for being synonymous because of their many striking similarities. The species Theriosynoecum forbesii (Jones 1885) and T. verrucosa (Jones 1885) are considered separate and not subspecies of T. forbesii. Theriosynoecum verrucosa occurs in the uppermost Morrison Formation of the Black Hills area, South Dakota, U.S.A., Theriosynoecum fittoni in the Lakota Formation of the same area. Theriosynoecum pahasapensis (Roth 1933) is, thus far, endemic to North America. A key to the described species is presented. Early Cretaceous species of Theriosynoecum are not yet as applicable biostratigraphically in North America as in Europe (e.g. the English Purbeck/Wealden), but this is due to the lack of data from the former area and considered to be promising once more data are available. Nevertheless, the “classicâ€ taxonomic approach provides a considerable step towards better application of these taxa as well as future analysis and robust discussion regarding the phylogeny, evolution and distribution of the limnocytherid subfamily Timiriaseviinae. The genus Metacypris is now restricted to an Aptian to recent lineage of small, weakly monosulcate Timiriaseviinae. Middle Jurassic to Early Cretaceous bisulcate and large taxa formerly designated as Metacypris are now assigned to Theriosynoecum.